Aaron Neuwirth reviews Spider-Man: Into the Spider-Verse, the best film about the famed web-slinger in over a decade. Right off the bat, Spider-Man: Into the Spider-Verse wants the audience to know how much fun the film plans to have with 55+ years of comic book history. Here’s a film that understands there have also been many Spider-Man movies and not all of them have been a hit with the fans. While this animated movie may seem to take this in stride, this doesn’t take away just how incredible of a superhero movie this film is. Thanks to a combination of great writing and an ambitious approach to the animation, Spider-Man: Into the Spider-Verse is the best movie about the web-slinging, fast-talking wall-crawler in over a decade. There is a lot to admire in how this film chooses to embrace its comic book source. While crafting a narrative that is a lot of fun, the idea of playing with the lore of the character goes a long way in showing just how malleable the superhero genre can be. It’s honestly hard to look at this film and not chuckle at how standard so many of the superhero films continue to be. Considering the need to show the origins of certain characters to audiences, before getting to play around in a sequel, it’s great to see a movie like this. 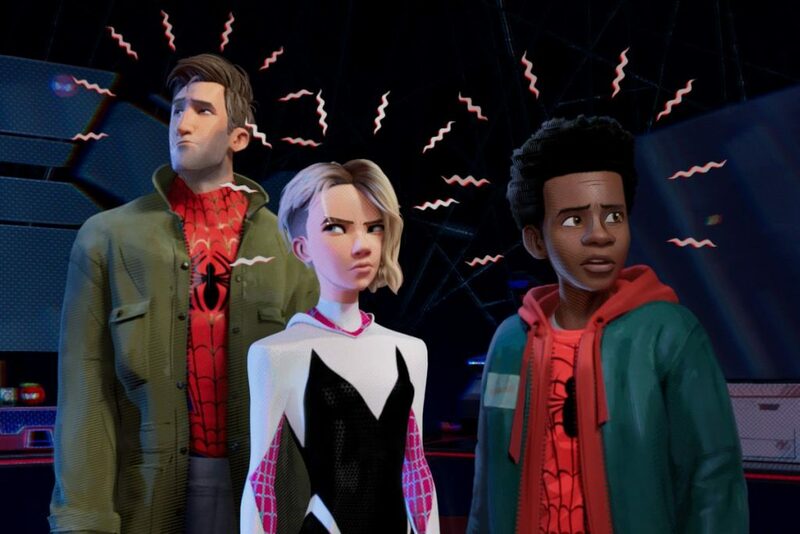 Spider-Verse proves that building a unique approach to these various comic book characters is not an impossible task. It gives me hope the right lessons can be learned from a gambit as intriguing as an animated Spider-Man film, but let’s back up a bit. 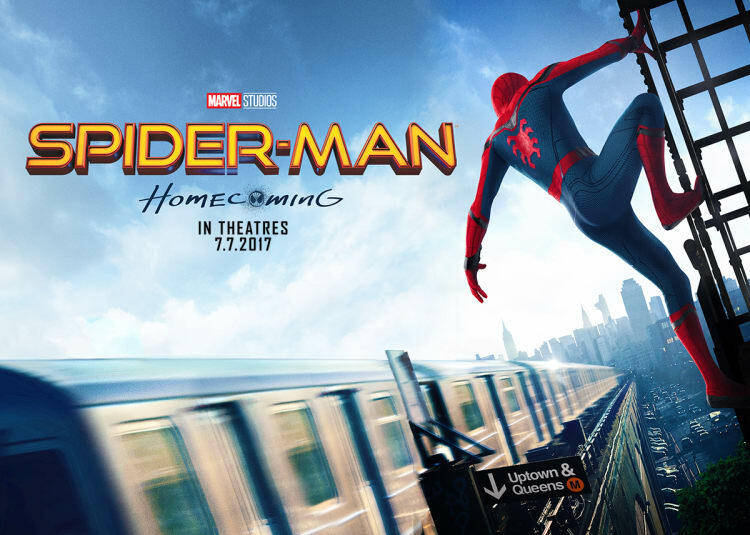 This particular Spider-Man tale focuses on Mile Morales (voiced by Shameik Moore), a high-school kid living in Brooklyn. Miles’ police officer father, Jefferson Davis (Brian Tyree Henry), has insisted Miles attend a private school, which has made it difficult for the high school kid to adjust. 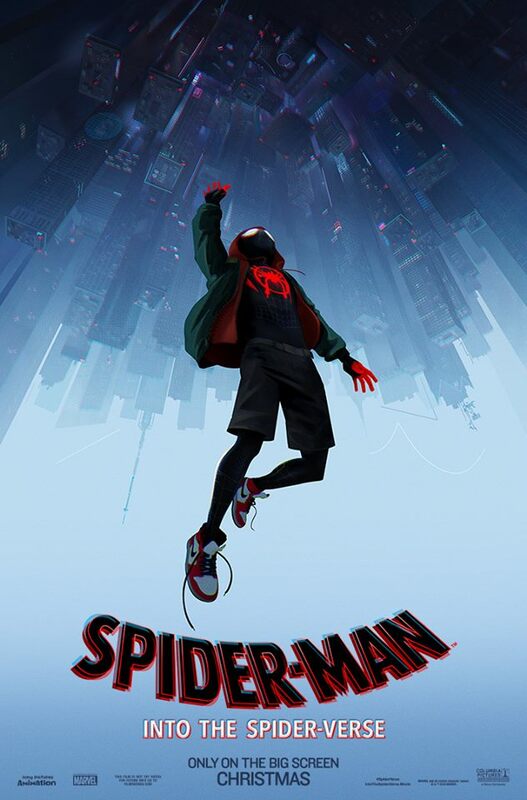 Things get even more complicated when Miles is bitten by a mutated spider while hanging out with his uncle Aaron (Mahershala Ali). And that’s not even the half of it. By the time we get to Miles, the film has already established that Spider-Man exists in this world. The film then throws a wrench in its universe by taking him out of the picture. What would that mean for people? Would the police be happy to see a vigilante finally stopped? Do villains such as the Kingpin (Liev Schreiber) get to run things? While Spider-Verse is full of great comedy and action (which I’ll get to), a big part of why it’s so compelling is the drama. An animated take on this character doesn’t need to hit that area, but it does, and it makes it count. 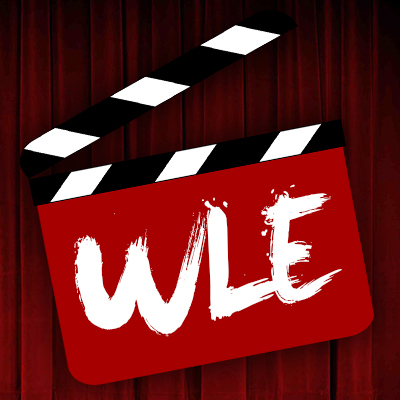 Life or death stakes are presented multiple times, and the film reckons with the consequences of certain actions. All of this goes into why Miles is such a tremendous new cinematic character, which Moore brings a lot to in his vocal delivery. That in mind, plenty of other notable characters also show up, and they all happen to be “related” to Spider-Man. Inspired by numerous comic book arcs, series, and characters that exist in the web-head’s multi-decade history, much of the film is centered on a dimensional riff that brings other Spider-Man characters into Miles’ world. 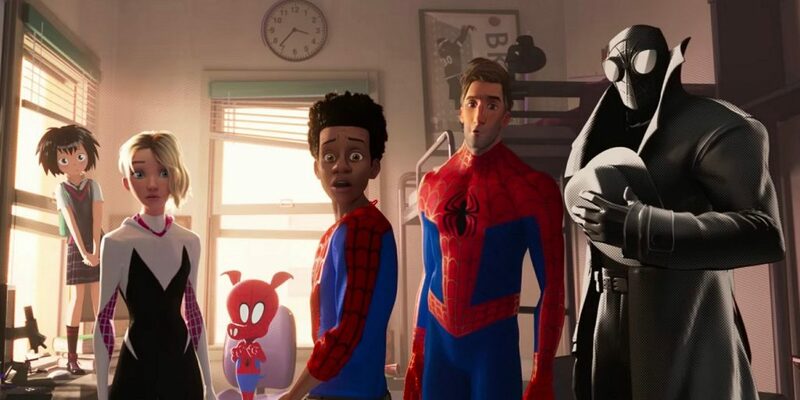 This includes Gwen Stacy’s Spider-Gwen (Hailee Steinfeld), Spider-Man Noir (Nicolas Cage, channeling Bogart), Spider-Ham (John Mulaney), Peni Parker (Kimiko Glenn), and an older Peter Parker (Jake Johnson). 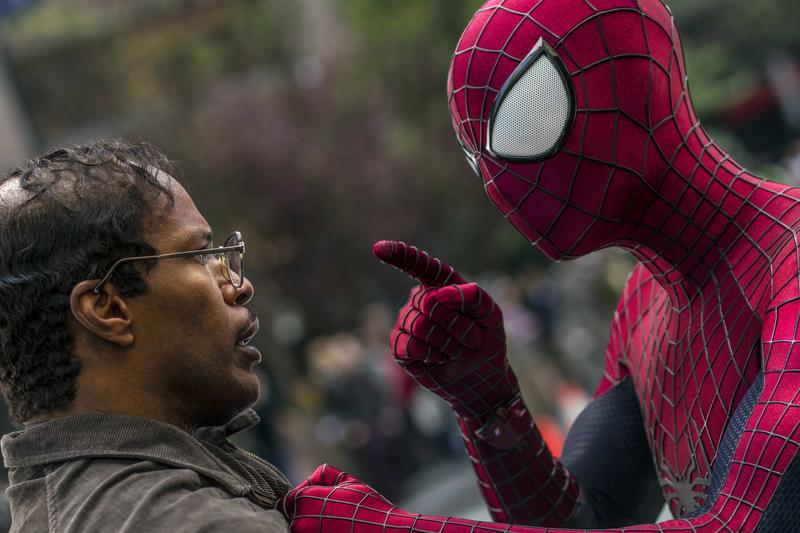 It’s Johnson’s role that helps push the story along, as well as provide more of an emotional edge, as he becomes a reluctant mentor to Miles. To spotlight Johnson’s Peter Parker a bit further, he’s given a backstory via montage, like all of the other Spider-People, but we see a sadder side of the story. This version is older and fallen on hard times that come with taking on the role of a vigilante continually working on the side of good. People in his life have died or left him, and the idea of training Miles doesn’t sit well. Fortunately, it’s a fantastic showcase for the vocal performances when it comes to layering strong thematic material that plays well with the story. It’s also an excellent way to bring all of the humor to life. Written by Phil Lord and Rodney Rothman, there’s a lot of funny business to go along with saving the city. The dialogue crackles with wit. Characters all bounce one-liners off each other with great pleasure. Self-referential moments never feel overplayed. And there’s genuine humanity that comes out of how everyone interacts. That this movie has plenty of heart works so well in its favor when it comes to seeing the film bounce back and forth between being a comic book adventure and dealing with what it means to be a Spider-Man or Spider-Woman. Technically speaking, Sony Pictures Animation have come up with something marvelous. Working with the largest animation crew for one of their productions, and headed by directors Bob Persichetti, Peter Ramsey, and Rodney Rothman, Spider-Verse looks phenomenal. 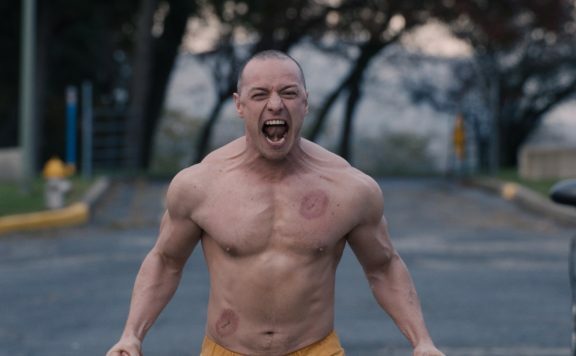 The entire film has an effect that makes it seem like it has been ripped straight out of the comic books. There’s a fantastic stylization that blends familiar imagery with some psychedelic stuff. It helps inform the audience on how the different dimensions can cross into each other, but it’s also different from any other animated movie out there. Existing in an animated world also means having a level of freedom when it comes to the action sequences. Now, Spider-Man films have never really stumbled in this area, but Spider-Verse manages to go for it as far as having Miles and the gang use their unique abilities in a manner that delivers all sorts of visual pleasure. Given the presence of classic Spider-Man villains such as Green Goblin, Scorpion, and Doctor Octopus, among others, it’s impressive to see a film that recognizes the challenges of building something new out of these encounters and wowing the audience with these moments. There’s so much more I can say about the film on both an animation and story level, but the film should just be experienced. This could have been a feature that merely told a Miles Morales story in an animated world, but it goes so much further. Clever touches to how we see Spider-Man, and an approach that suggests no limits to the imagination have led to one of the best superhero movies out there, animation or otherwise. Where things go from here, I’m not sure, but with a great script and animation, came great results.